Since my skin has cleared up I’ve been extra careful with the products I use on my face but I hadn’t really thought about how I wash it. I mean, yes people have used their hands for years and it’s worked just fine but my skin just isn’t like other peoples. Not to mention the fact that my pores are huge and I commute on public transport all week (hello nasty dirt and pollution settling into my pores, I see you) ; so perhaps it was time I invested in something to help me get into all the unreachable parts of my face and have a good old clear out. My heart yelled MAGNITONE! but my bank balance said no. I needed a cheap alternative with low maintenance i.e. no batteries/charging time. After a browse around in Boots I came across what is now my new favourite cleansing product – Champneys Facial Cleansing Brush. Champneys is one of the UK’s oldest spas that now stock their products range in Boots available for us all to buy and experience the luxury treatment they provide at home. I’ve seen it around for quite a while but truth be told, I’ve never picked up one of their products until now. Champneys facial brush is a small (hand sized brush) with a clear plastic handle and soft synthetic bristles at the head of the brush. 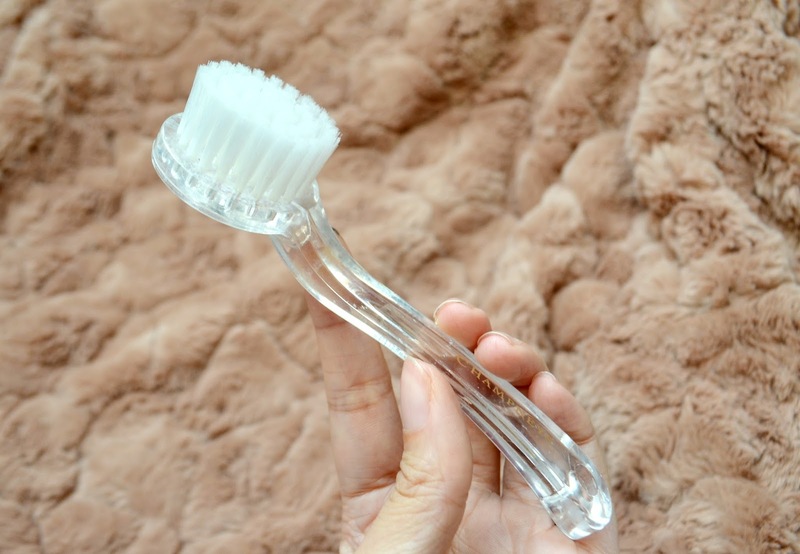 The two most important things for me were ease of use and how the bristles felt on my skin. In terms of how easy it was to use, well, let’s just say it got top marks from me. The brush is extremely lightweight so it’s not a strain on my arm and it allows me to have better control of how much strength I’m putting into my cleaning motions. The brush head itself has a decent surface area too, which means that you’re able to get it into places like the side of your nose, allowing you to concentrate on really getting into all the nooks and crannies. The bristles are soft enough not to feel abrasive on my face and because they’re synthetic, they do spring back into place, which is perfect for clearing out my pores. I suppose my biggest worry with using an electric brush was that I wouldn’t know if I was being too harsh on my skin. I’ve got sensitive skin as it is, and I’m not always too sure what will irritate it and so, with a manual brush I’d have full control of how I use it. Champneys have recommended that the brush is used 1-2 times a week for a deep polish but I’m going to be completely honest with you, I use it every other day. Firstly my pores are huge and who knows what sorts of dirt could settle in there and secondly I wear full coverage foundation most days and so the only way I can be sure that it’s all off is by using my trusty Champneys facial brush. The best way to use the brush is to squeeze your facial wash into your hands and dip the brush into hot water. Create a foam in your hand first and then move it on to your face. I’ll be honest, I have no idea why Champneys have advised that this is the best way to use the brush but I’ve stuck to it and it works pretty well for me. It’s also important to remember to use antibacterial soap to clean the brush regularly. I use the same circular motion in the palm of my hand to get it cleaned and then let it air dry. Priced at just £6 this is one serious bargain buy. It’s such a sturdy piece of kit that you won’t even be having to replace it again and again. I’d seriously recommend it to anyone and everyone but particularly if like me, you use heavy makeup on a regular basis. 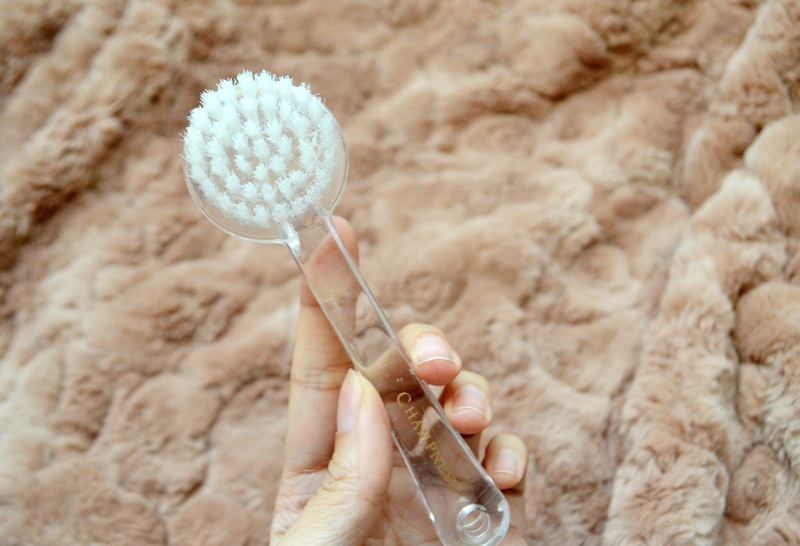 Have you ever used a facial brush?